I’ve always been a bit of a renegade, mostly living on the fringe of what ‘everyone else’ was doing. At 66, it is no different. Today I live a deviant life. It’s true. 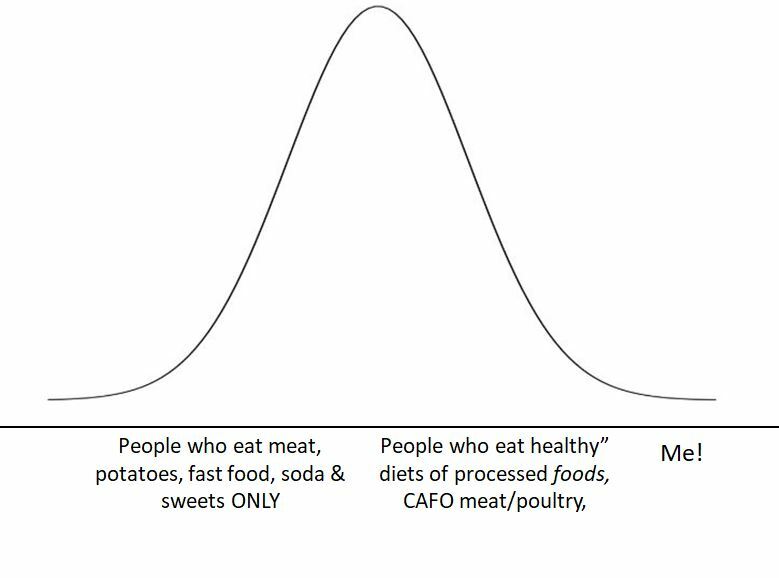 In the truest mathematical sense, I am a deviant in that my commitment to the health of my physical body puts in an extremely small percentage of Americans. I eschew all gluten, dairy, processed foods, nightshades, nuts, soy and ALL GRAINS because I want to heal my digestive system. Is it challenging? You bet! Is it a pain in the neck? You bet! Do I feel better? You bet! My psoriasis is gone. The bendy, arthritic joint of my little finger seems to be actually straightening a little bit. There is no pain in my body and I have a ridiculous amount of energy. Why do I feel so great? It’s simple. I’m a deviant! I take inconvenient actions that result in a healthier physical body. I treat my body as the finely tuned machine it is. We humans are homo-sapiens… ALL OF US are part of the same species and our bodies have been honed over more than 200,000 years of evolution. Our human machine requires a certain upkeep and maintenance in order that it operate at peak efficiency for as long as possible. Consider that when you buy a vacuum cleaner or a toaster or a car, you get a manual that tells you how to maintain the machine. But when you have a baby, it’s just handed to you! No instructions! No booklet! My lecture series (and upcoming book) is “The Art of Living Longer User Manual for Humans” and is based on what science knows is the proper upkeep and maintenance for our human machines. In case you’re curious, it’s quite simple. Move your body as much as you possibly can, i.e. don’t sit all the time; eat clean, whole, unprocessed food grown and raised the way nature intended and make sure your plate is colorful as a brown/beige plate indicates poor variety, nutritional deficiencies and a lack of fiber, all necessary for proper digestion. And make sure to get plenty of hydration and sleep for your brain. Remember, as a human, you are a bio-chemical feedback system wrapped in an electro-magnetic field living in a responsive, energetic universe. Your thoughts are the genesis of the energy that pours from you in points or waves of vibration. Do you give off “good” or “bad” vibes? Whatever it is, it’s coming from you – from the way you think. I believe Tinkerbell was onto something when she told Peter Pan to find his happy thought in order to be able to fly. Have I peaked your curiosity? All of this is part of the wisdom of “The Art of Living Longer User Manual for Humans.” For more, check out my website, Facebook – @AnneGoldbergTheSavvySenior, @WisdomoftheAGETV. Join me on this journey into aging in the 21st century. Learn the art of living longer. The Art of Living Longer User Manual for Humans™ is an original approach to a happier, healthier life based on the most current evidence-based, peer-reviewed science and research. For more information on hiring Anne as your Keynote speaker, for decluttering, kitchen coaching, or your personal legacy documentarian, contact Anne. « Previous post link Why Bother Being “Healthy”?